We talk a lot on this blog about the pros and cons, ups and downs, benefits and drawbacks of working remotely. There is a seemingly endless well of inspiration to pull from when you work from home, as each day brings new adventures and your next challenge is likely just around the corner. Last month, we heard from one of our amazing virtual assistants and all-around go-getters, Kimberly, about her daily routine as a work at home mom—and WHOA was I in awe of her after reading that post. I mean, I already knew she was incredible, but when I found out she wakes up at 4:30am? Game changer. So, as I sit down to write this post, I recognize that my day to day is pretty bland and simple when compared to some, DPM-ers and otherwise. However, I have someone with me everyday when I go to work in my home office who depends on me, vies for my time and attention, and at the end of the day (or the middle of the day, or first thing in the morning, or anytime he feels like it) just wants to snuggle. My husband Brad and I got married over Memorial Day Weekend in 2012. Brad grew up in an animal-free household. I was raised with ALL THE ANIMALS—dogs, cats, rabbits, hamsters, salamanders, and even horses. Dogs were a constant in our house and when I was 12, we had FOUR dogs all at once. Things were a little rough at first. 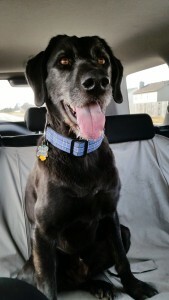 Ace had never ridden in a car before, so he got sick every time we went anywhere. We were determined to crate train him, but he had other plans. He had food allergies, and we had to go through MANY vet visits and a few different kinds of food (not the cheapest, mind you) before he was eating and not getting sick. That being said, a year of growing pains were worth it—and now we have a sweet, protective, and loving pup. 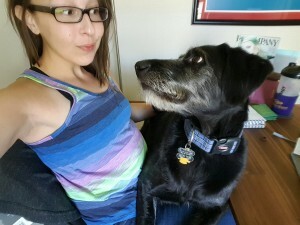 What’s It Like to Work From Home With a Dog? For me, it’s pretty awesome. Who doesn’t love a furry companion who just wants to warm your feet? It can also be hugely frustrating. When you’re on a conference call and the sound of dog whines can be heard in the background, things get weird. Yes, this happens to me on a regular basis. 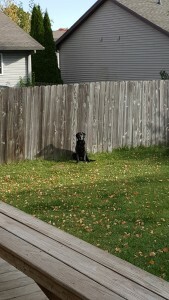 Ace loves to be outside and, if I’d let him, would probably be content to spend hours at a time in our backyard. But just like kids, time unsupervised can lead to not-so-great outcomes: digging holes in my flowers, chasing innocent bunnies like a madman, or any sort of general messiness that can occur when a dog is left alone to play with dirt and mud. Of course, I still wouldn’t trade my situation for anything. Once Ace got used to the fact that I was going to be home during the day—and that no, I wasn’t going to be available to play with him every minute—things calmed down. We have a pretty good groove going on that includes several small breaks throughout the day for walks, throwing toys around, or just hanging out without my computer in front of me. You might think it sounds crazy (if you don’t already think I’m crazy by this entire post about MY DOG), but Ace will actually put himself between me and my computer when he REALLY wants my attention (again, see photo evidence). Sometimes taking my work to the couch so he can cuddle with me while I type away is enough. Other times, I have to abandon ship completely and give him some much-needed exercise with a few laps around our neighborhood park. When I worked in an office from 9 to 6 every day, Brad and I often took Ace to a “doggie daycare” to get him exercise and fun during the day. I LOVED this place (Ace REALLY loved this place) and we actually take him there when visiting our former city. But it’s still so much better for me—and I think for Ace—to spend our days together. He gets extra special attention, and I have to admit that I like the companionship of having my dog with me while I work. If you’ve made it this far through this love letter to my dog, I’d love to hear about your experiences with co-working with your pet. I know I’m not the only crazy dog lover out there, so share your stories with us on Facebook and Twitter—and don’t forget a picture of your pet!